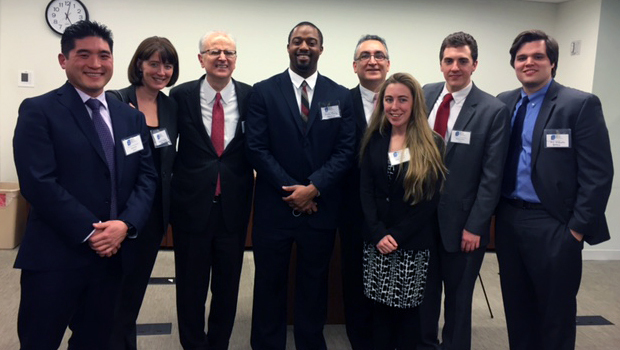 On Monday, March 16, six of Hofstra Law’s eight Pro Bono Scholars attended the 2015 Pro Bono Scholars Reception at the offices of Legal Services NYC. At the event, students had the opportunity to meet and network with Chief Judge Jonathan Lippman, Chief Administrative Judge A. Gail Prudenti, Legal Aid Society and Legal Services of NYC attorneys, and Pro Bono Scholars from other New York-area law schools. 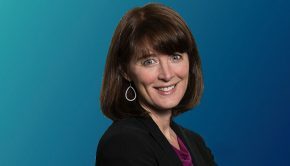 Jennifer Gundlach, senior associate dean for experiential education, clinical professor of law, and director of the program at Hofstra Law, accompanied the students. In June, Hofstra Law announced its inaugural class of eight Pro Bono Scholars as part of Chief Judge Lippman’s Pro Bono Scholars Program. During the final 12 weeks of the spring semester, the scholars will provide 500 hours of pro bono legal assistance under the guidance of a supervising attorney. Their work involves direct client contact with low-income individuals who cannot afford legal representation. The scholars also spend time training and participating in a 2-credit weekly seminar and were permitted to take the New York bar exam in February 2015, before they graduate. Assuming a passing score and successful completion of the Pro Bono Scholars Program and all graduation requirements, the students will have the opportunity to graduate in May and be admitted to practice in New York in June 2015.